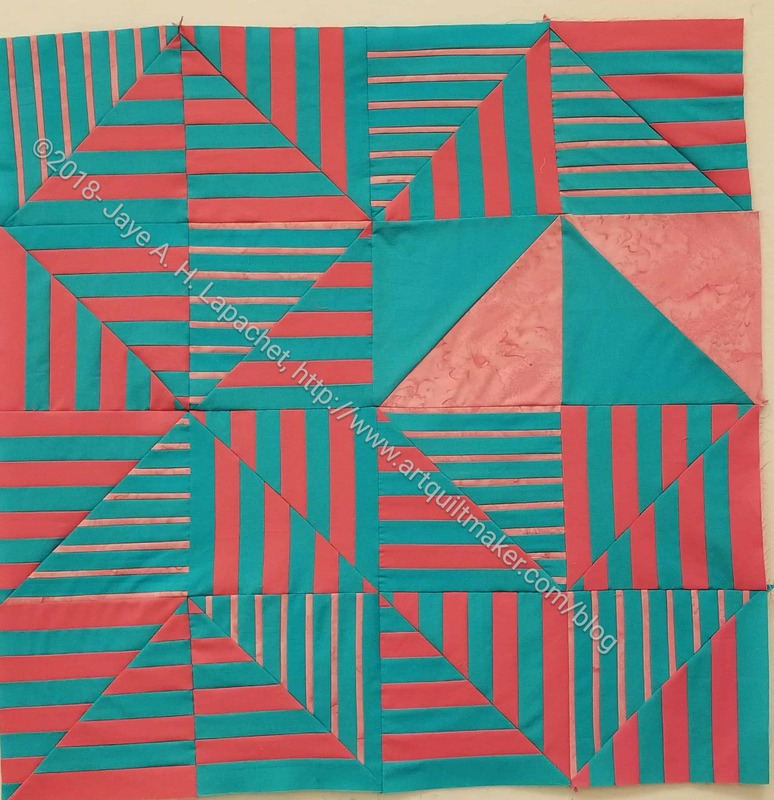 This covers my second post of blocks for Quilts for a Cure. I forgot to post these before I sent them off about a month ago. I like these better than the first group. I have to admit my error. I don’t know if they will be able to use these blocks. I found the information about size, etc after I mailed them and I made the wrong sized blocks. Perhaps they will get someone to sash them? I don’t know. All I know is I did my best when I had a lot going on. Well, as you read this, I will be getting back to real life. Yesterday was class day. A lot of people were done with the conference – tired, ready to go home, out of money, etc. I was ready to sew, so a class was just what I needed. 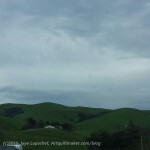 We got up at, what felt like, the crack of dawn and hustled over to the classroom. We wanted to get there a little early because we wanted seats that we wanted. 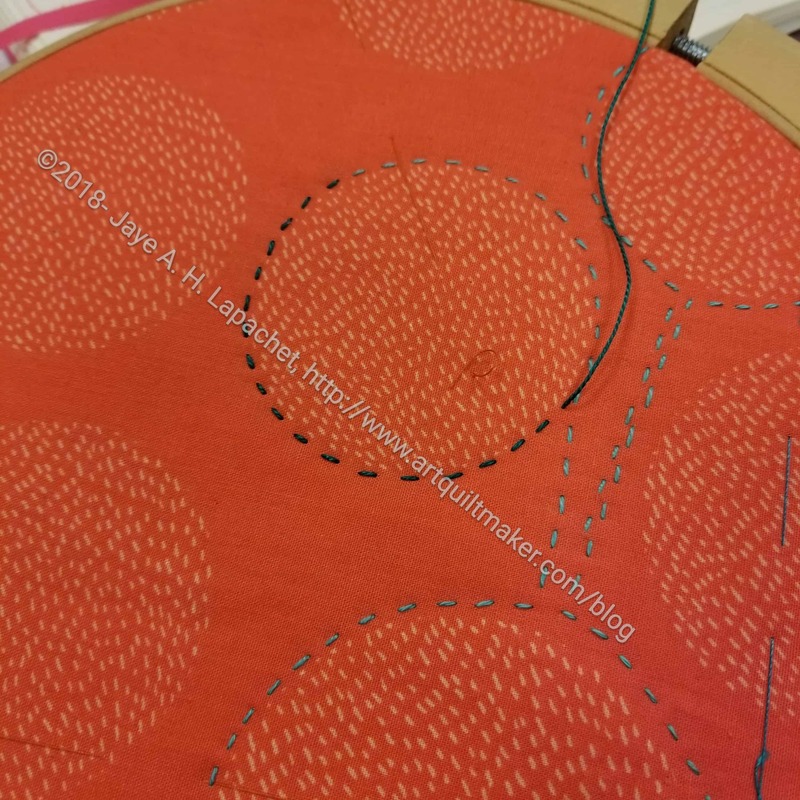 There were two different Janome machines to use. We both chose the 6700 models (I think there were letters after them, but I forget what they were. 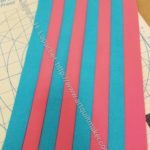 We made stripes from solids and semi solids and then cut them up. There were several options. 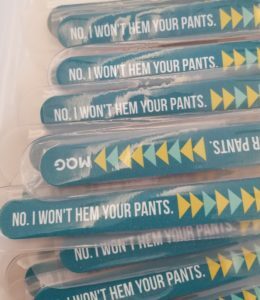 The strip sets I made were two of the options. One was the regular set and the other Libs called Biggie Smalls. I decided to go with the easiest options so I could get the jist of the technique. Once I cut up the strip sets, I was able to put the blocks on the design wall and look at them. 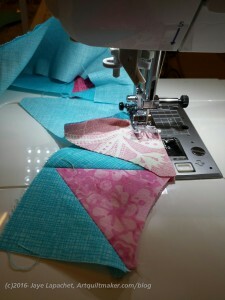 The triangles don’t all go together, because the fabrics were slightly different. Still, I was pretty happy with my first version. I moved the units around and then started sewing. I came away from the class with a small finished quilt top and I am pleased. I need to press it a lot better, but I am happy with it. 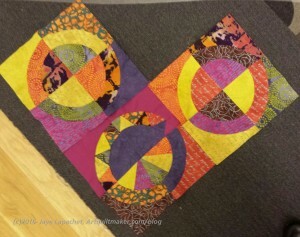 I added in the solid HSTs to fill in where I was two blocks short. I think this is an ok piece. I think the technique is interesting, but my piece is definitely a practice piece. 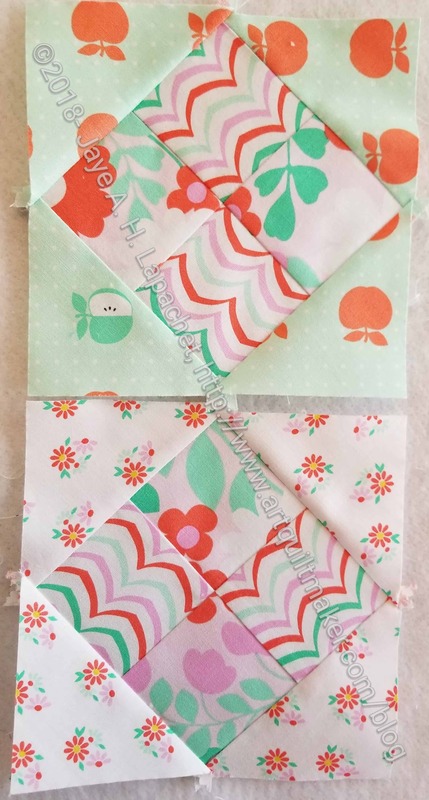 I’d like to try the technique with actual striped fabric (smaller blocks) to see what I could make. I am not sure I will use this technique in general, but I am glad to know it and I am really glad I took the class. We are starting to get tired. walking on concrete all day for several days is difficult. The show and the ancillary events are super fun, but also tiring. We went to the main hall to finish looking at the quilts and finish looking at the vendors. Today was also class day for both of us. Other people are also getting tired, I think because even though people were friendly, they were not as gregarious. Probably the most important event of the day was the Sarah Fielke class I took. 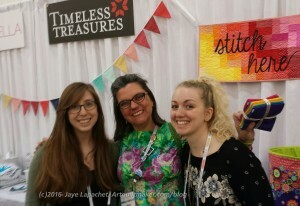 This was a fabulous class on Big Stitch. I was concerned that it wouldn’t be what I needed. 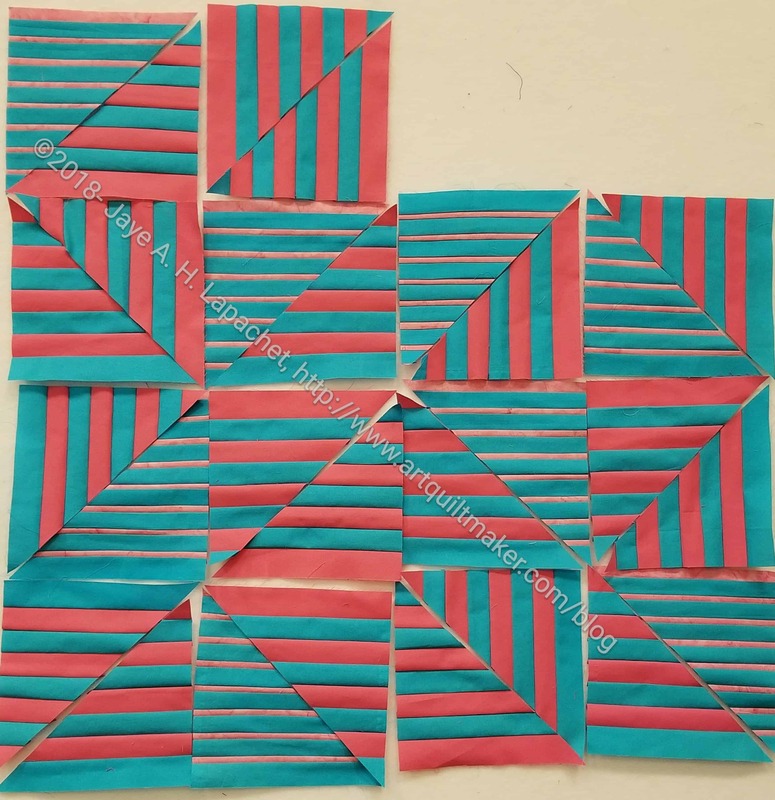 I started to obsess about the class being a hand quilting class when I wanted to learn any special techniques to use Perle Cotton. My fears were unfounded. It was a great class. 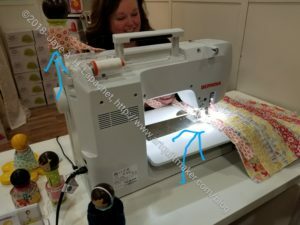 It was, basically a hand quilting class, but Sarah built on my existing store of hand quilting knowledge and refined it so I could wield a needle with Perle Cotton like a pro. The instruction lasted about 10 minutes, once the introduction was finished and a lot of techniques and information came together in my mind. 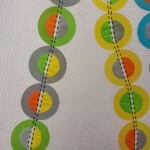 I finally understand the rocking motion that is so critical to good hand quilting. Not only do I understand it, but I can do it with confidence. YAY! As an added bonus, I got to try out the many spools of Aurifil and Sue Spargo Perle Cotton I have been collecting. But wait! There’s more! It was fun. I enjoyed sitting there and practicing the stitching. The class was totally worth the time and money. Julie took an Angela Walters class while I was in Big Stitch. We have another class tomorrow with Libs Elliott. I was pleased to see a SAQA exhibit, Modern Inspirations; Art Quilts From the 1970s through Today, in the back of the hall near the demo station. 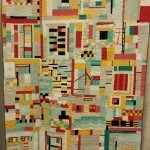 It was filled with ‘modern’ quilts made over the past 30 years. 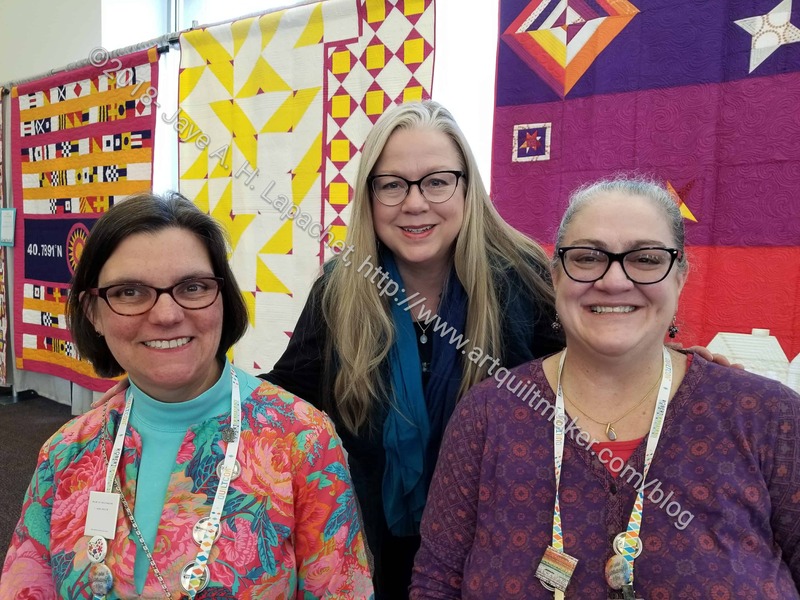 Some looked like they would fit right in with the quilts in QuiltCon’s 2018 exhibit. Waves by Etsuko Takahashi, 1998 was one of my favorites in this exhibit. It is made from Pointillist Palette fabric and is such a fantastic use of the fabric that it takes my breath away. 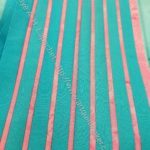 Though the fabric is already ombre, the gradation between fabrics is incredible. 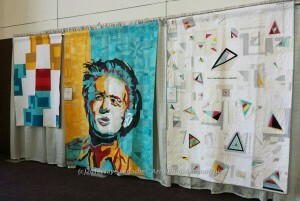 All of the quilts fit right into the QuiltCon exhibition. Early in the day, we heard the Keynote Carolyn Friedlander. She spoke about her inspiration, her various fabric lines and a book. 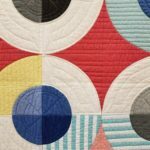 One thing she does is make quilts over and over exploring different options in each iteration. I was interested in her talk and thought she did a great job. Many people walked out, grumbling that the keynote wasn’t what they expected. ??? I was confused about that, because I got what I thought I was going to get and thought Carolyn did a great job. People are weird. 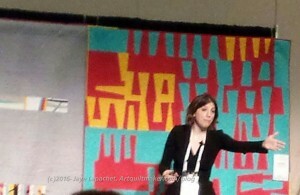 The keynote was right at noon, which made lunching difficult, so, perhaps, people were cranky? I think the vendors were tired as well. They were perfectly friendly and helpful, but not as perky. Early in the day we walked around the hall a little. 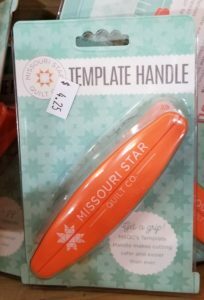 I bought an interesting template handle. It is much smaller than others I have seen, but I thought it might be useful for my smaller rulers as well. I also bought a Daylight lamp. 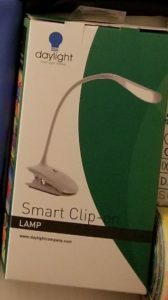 It is a small, portable clip on lamp that I hope will illuminate my work surface even more. 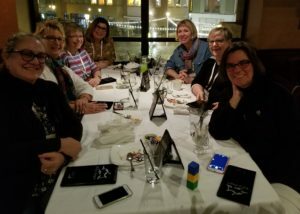 We skipped the QuiltCon Happy Hour. Julie went back to the hotel and I went to dinner with Tim and Cyndi at an Italian restaurant. The waiter was fabulous and my pizza was delicious. The restaurant was far away so it took me awhile to get my food. 😉 It was worth the wait. One more day then back to real life. Day 3 was just as good as Days 1 & 2, but I don’t feel like I saw as much. We stayed mostly in the vendor hall, which also has quilts. All of the winners are in the hall with the vendors and we decided it was time to look at them. 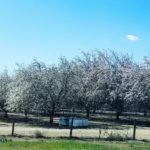 I saw so many of them posted on social media that I didn’t think it would be worthwhile to see them in person, but it is such a different experience. 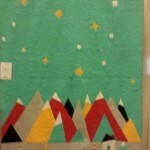 Social media is awesome if you can’t be there in person, but I see the quilts differently in person. We spent the first part of the day looking at the quilts. The winners were pretty amazing in some manner. The secondary winners (challenges, etc) were interesting as well. 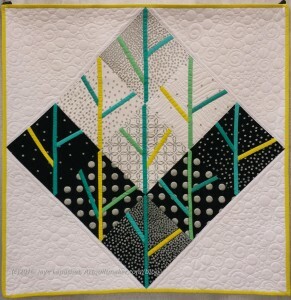 Once quilt I really liked was Clambake by Heather Black. 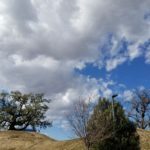 I liked it when I saw it, but liked it even more after reviewing photos on my phone. It is a simple design, but not boring.The background red is an interesting shade. 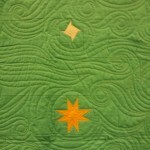 I also really liked the Heart of Gold quilt by Beth Chinderie. 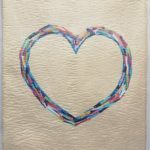 I like it that the pieces that make up the heart are not pieced or appliqued, that they are fused (possibly), then quilted down. This endeavor migrated to looking at vendors after about 5 rows of quilts. 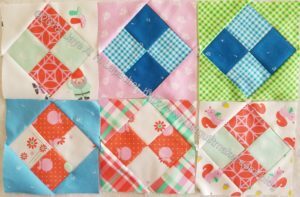 Michael Miller is collecting charity blocks to make quilts. 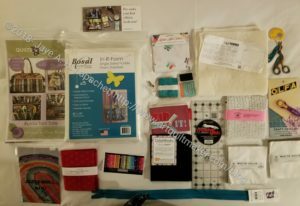 We got some free charm packs to make blocks for the quilts. 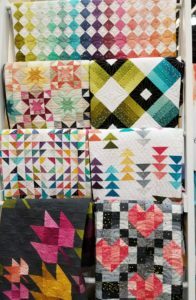 After QuiltCon 2017, they made 9 quilts out of donated blocks to donate to kids with cancer. I have a charm pack of 12 charms and I am thinking about how I can use it to make the most 6.5×6.5 blocks possible. I might make some checkerboard blocks just to maximize the number of quilts I can make. 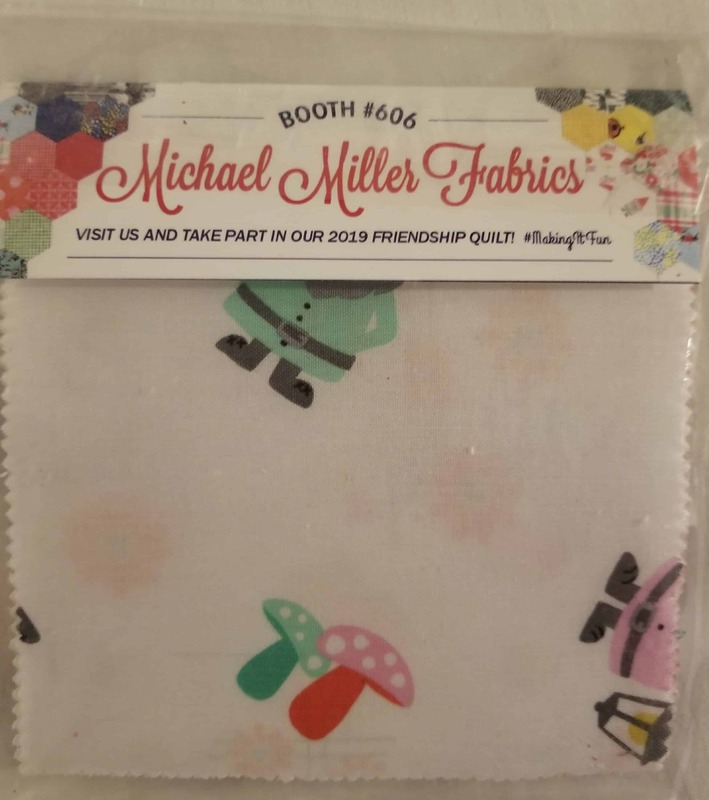 In the Michael Miller booth, as an added bonus, I got to meet HollyAnne, a Twilter, who is the CEO of Quilts for a Cure. She is a lovely person, which made the meeting fabulous. She turned us on to a little giveaway game. We went around to different booths and got punches, chatting with people as we went. In the course of getting punches, I found out that my rotary cutter, which broke recently, has a lifetime warranty! I have to call the customer service number and see what they can do for me. We also checked out the Daylight Lighting company and I am sorely tempted to buy multiple products. We’ll see what I actually do buy. I plan to to at least buy one of the clip on, portable lights, but may buy a larger one as well. I did buy some things .There is so much available and I have my limits in terms of space and time. Some of the things shown in the photo (right) were freebies as well. 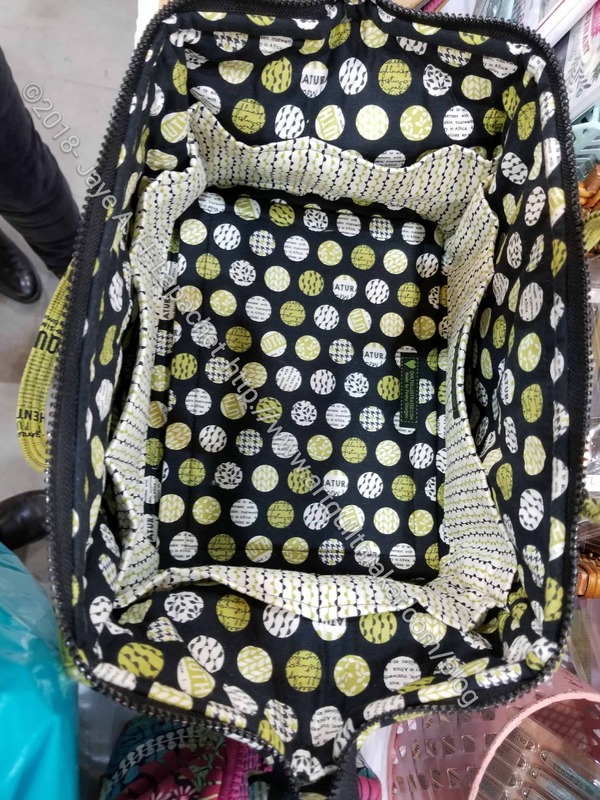 I found a bag pattern that I had to buy. It is a tool tote with an interesting design and a super cute look. 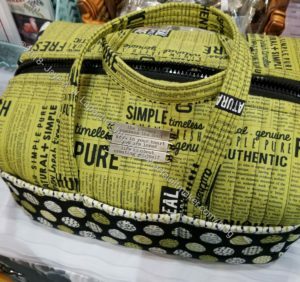 I have a the Oslo Tote by Sew Sweetness, which I think is similar. Of course, the fabric helps to make it appealing. It is a tester for a project on which I might be working (far left, top) and it is called the Tool Tote. It has a frame to keep it wide open (see photos below). I have tried a pattern with a frame, though I have another pattern that calls for one. I am kind of excited about trying out a pattern with a frame. To go with that pattern, I bought Bosall and a zipper. The Bosall is like Soft & Stable, but is fusible. 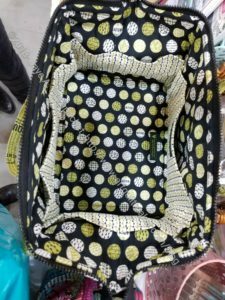 My Organizer Club by Crafy Gemini calls for this product. 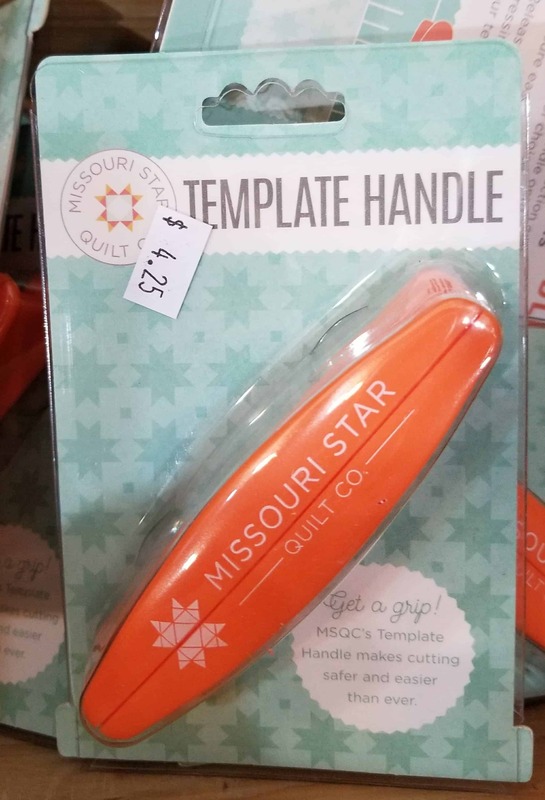 I thought it was a Soft & Stable knockoff until I talked to the lady at the Elkhorn Quilts booth (great company, fab bag patterns and supplies, BTW). I didn’t realize the Bosall was fusible. Not only does the Organizer Club call for this, but this tool tote does as well. I am not sure *I* would use a bag like this, but I might and the design is so fabulous. 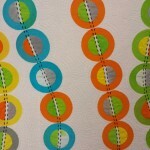 Gretchen has been talking about the Jelly Roll Rug. I saw a pattern and bought it on impulse. I got a brief lesson on the making of it in the Moda booth and can visualize how it is done in my mind now. 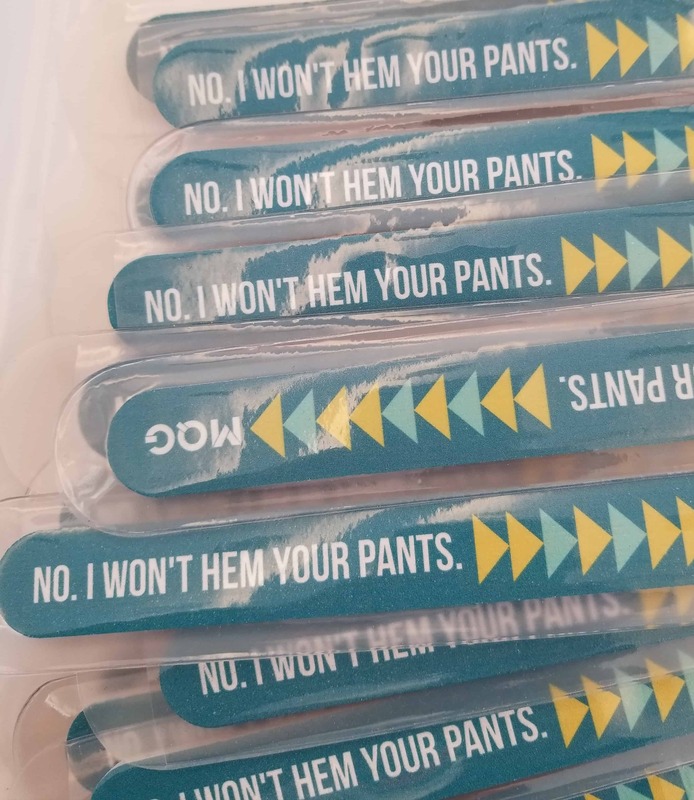 I am not sure where I would put one, but may make one anyway. I bought a few pieces of fabric. 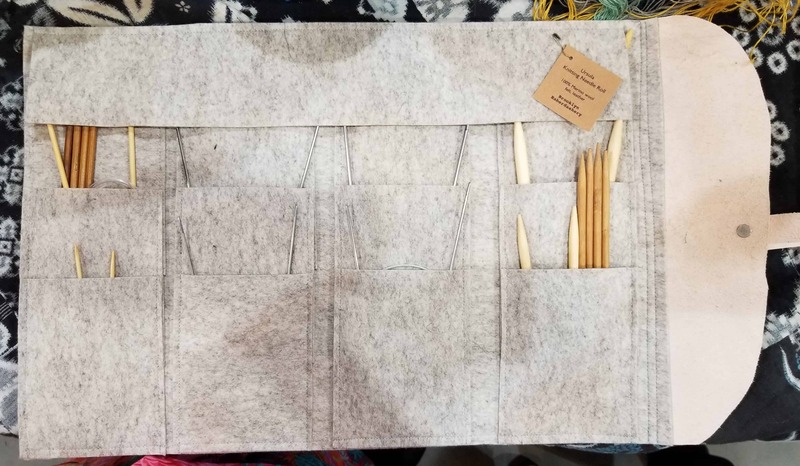 I couldn’t find any Northcott charm packs in white, but I did find some by Paintbrush Studios, so I bought those to have on hand when I need to make more donation blocks. These were the one thing I planned on buying. I bought a great red and a text fabric. I am still trying to be restrained. Not all of the booths were there to sell things. Some were promotional only. 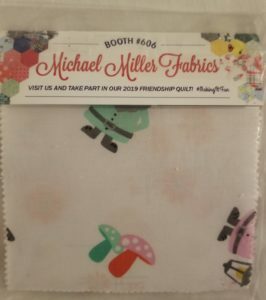 I stopped by the Moda booth while Julie was ont he phone and talked with Vanessa Christensen about her new Confetti (metallic dots) Ombre Line. 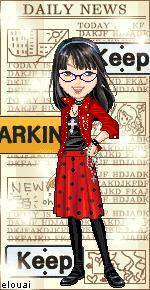 It is Moda, but I love the designs. 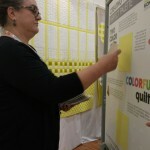 Vanessa Christensen was in the booth showing the ins and outs of her ombre/metallic dot fabric. 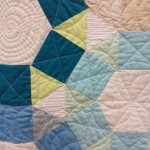 I am particularly fond of the heart quilt. 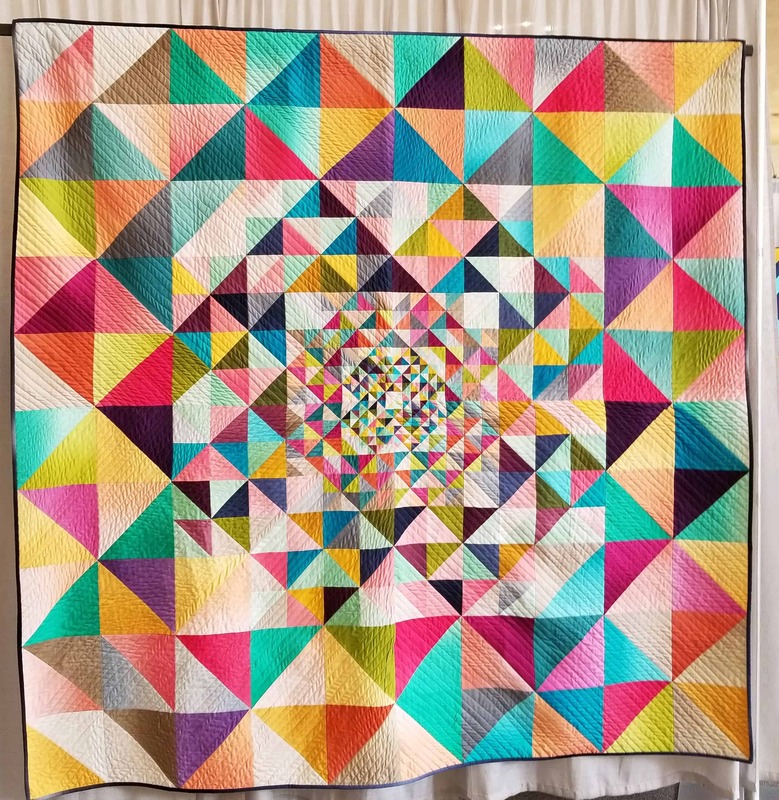 I am not much of a heart person, but this quilt is really great. We spent time in another lecture today. Today’s lecture was with Pamela Wiley. 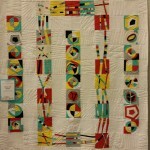 If you haven’t seen her quilting, it is amazing. She talked about finding your own stitch identity/style. 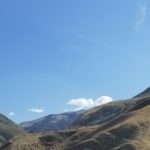 Her talk was about getting inspiration from her surroundings and using the inspiration for her work – what she sees, how she thinking about it, how she tries to translate into something I could read. Happy was spent at Porto Alegro. We started out there with Tim and Cyndi. When we left, Anna L, Mary C, Amy M, Christina T and Christy were all there as well. We had some drinks, talked about whate we liked and disliked about quiltmaking and the world and generally had a rowdy time. I am starting to itch to stitch. Day 2 of QuiltCon 2018 started out slowly. We didn’t have any classes and our lecture wasn’t until late, so we lazed around a little bit in the hotel. It may not have been the wisest move, because I poured hot water all over my hand and had to stand letting cold water run over it for several minutes. It was painful all day, but after many applications of cream and some Argan oil, I don’t have a blister and it doesn’t hurt anymore. 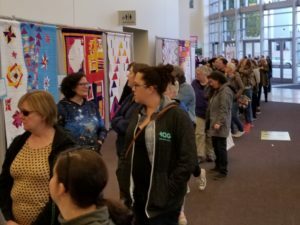 Once we got to the show, we went straight into the hall that just had quilts. (The other hall has vendors and quilts). It was a nice viewing experience. There was good light and it wasn’t super crowded. I thought I would feel resentful at all of the solids, but I didn’t. 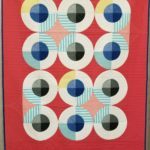 Some quilts I didn’t care for, but the ones I liked I thought were really well done – good fabric choices, interesting designs. I do know why the Carpenter’s Wheel didn’t get in this year. It wasn’t made of solids. We haven’t gone through the entire vendor hall, but there seem to be more vendors that last time. We have gone through about a row and a half of vendors and I bought one yard of fabric. It is canvas and I plan to use it for a bag, perhaps the Rockstar bag by Sew Sweetness. Perhaps something else. We will see. I am determined to make something out of it soon and now allow it to lay around. 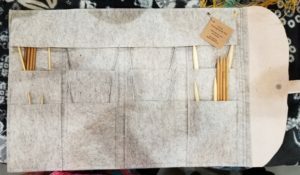 I saw a lot of fabric and supplies I liked, but didn’t want to commit to buying yet. 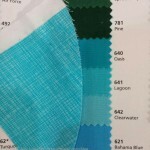 Beyond the Reef had a lot of great fabrics, but I restrained myself from buying the Palm Country Layer Cake and random other yards of fabric from them for the moment. I did want a few of them, but don’t have an immediate use. I may go back and buy some things later, but want to see if I am still thinking about them tomorrow or the next day. Brooklyn Haberdashery was there and they had a knitting needle case that I covet. It was $95, however, and that is just not happening, especially since I just bought needlecases with some Christmas money. One thing I may buy is a binding buddy. They are about $17 and slightly too cutesy for me, but they seem really useful. Shari Butler was showing how they work. You roll your binding around the body of the binding buddy, When you are ready to bind a quilt, you put the Binding Buddy on the thread holder, which allows the binding to roll of the buddy either from the back or the front depending on the way it is originally rolled on to the binding buddy. 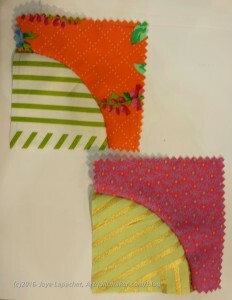 The nice part is that you have somewhere to store your binding while finishing the quilt. As mentioned we had a lecture yesterday. The speaker was Christopher Tomlinson (IG: the_tattooed_quilter). 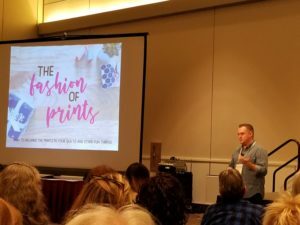 He spoke about using prints in quilts. He admitted to not knowing the technical terms for color theory, so there was some confusion when he was talking about shades and tones, but I ended up getting the jist. The lecture wasn’t a revelation to me but it also wasn’t boring and was definitely entertaining. The slides were really well done. Today was also a day of visiting with friends. We ran into a number people from the guild, had dinner with Tim while Cyndi took a class. 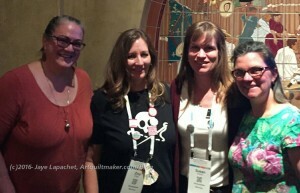 We ran into Annie Smith in the vendor hall as well. We were also able to have some coffee with Luana, the owner of eQuilter. We had about 45 minutes to chat and the location was pleasant since we were surrounded by charity quilts. We chatted briefly with Zina (IG: zanymouse) about dinner. At one point, Julie wanted to sit down , so I went into the vendor hall. 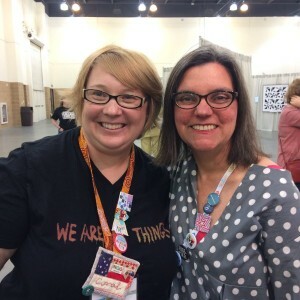 Almost immediately ran into the fabulous Christa Watson (IG: christaquilts). I chatted with her for 10 minutes or so until I had to leave to meet up with Julie. We talked about her new line of fabric and I helped her rearrange her display of quilt samples and books. She told me about her fabric and that she will be coming out with a new line as well. It was great to catch up with her. She is just as positive in person as she is online. We went to Tokyo Wako, a restaurant across from the convention center for dinner with Tim (IG: timnrwc). It is. 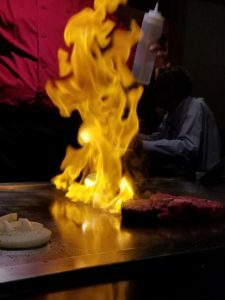 The food was really good and the whole experience was fun!! They were very attentive to my #glutenfree needs, which was great. The chef came over and put on a little show while he cooked on the grill in front of us. He was nice and was able to cook the food exactly to our liking. It was a great day, though tiring. I look forward to a good day today as well. We are already having a good time. I drove down to Julie’s house Tuesday and spent the night. I had dinner with her family and looked at all of her quilt stuff before we left. We set off for SoCal on Wednesday. The drive was not bad. I mean we were in the car for several hours, which isn’t that great, but there was limited traffic. 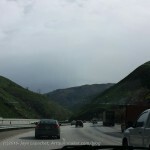 Julie was able to drive the whole way, probably because we needed to stop every two hours or so. 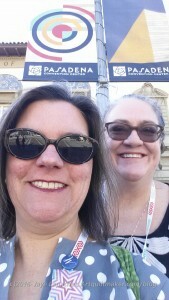 We made it to Pasadena by 3 or so. We checked into our hotel room and got settled a little bit. Sadly, my ladies maid was sick, so I had to do most of the settling myself. 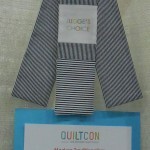 At about 4:40 we headed over the Convention Center to get our badges and enjoy happy hour sponsored by Culcita Fabrics. The line was LONG. It was fine. We saw some people we knew so we could chat while we waited. They started checking people in a few minutes after 5pm. Julie and I both received goodie bags, which were moderate this time, but had some useful stuff. We met Tim and Cyndi as well as Kathleen and Sarah. The drinks for the happy hour were really expensive, so popped over to the Sheraton and took advantage of their happy hour prices. 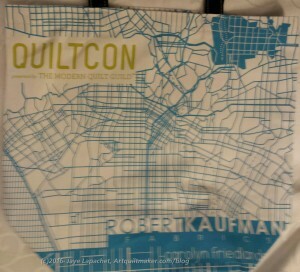 We checked out the Culcita Fabrics booth, which was right outside the registration area. They have a modern fabric subscription. They send out bundles of fabric every month or two months. They have specials for QuiltCon. 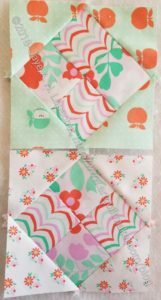 The fat quarter bundles seem reasonably priced, but I thought the half yard options were a little on the pricey side. Of course I am tempted, but 1) space in my fabric closet is at a premium, 2) I have plenty of fabric. They have bundles from past months for sale and I might buy one of those. We’ll see. Kathleen rushed us off to dinner and it turned out to be a group of 7 – Julie and me, Kathleen, two Canadians, Marianne and Susan, and two ladies from Sacramento, Angelina and Judy. It was great to chat with them. It was a very intelligent group of women. 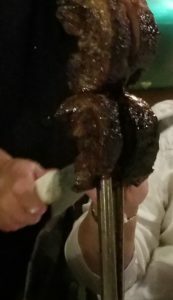 We gorged ourselves on Brazillian style skewered meat served at the table by cutting off slices. There was also a buffet of a variety of salads. I ate a really nice beet salad, some rice, fruit and cheese. We had a lot to talk about so the conversation was free flowing the whole time. There were definite opinions about a lot of things (me and improv!). All this and guess what? The actual show doesn’t start until tomorrow! 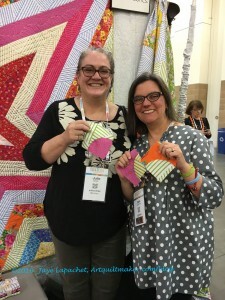 I can’t seem to stop writing about QuiltCon. Different aspects of the event are in my mind often. 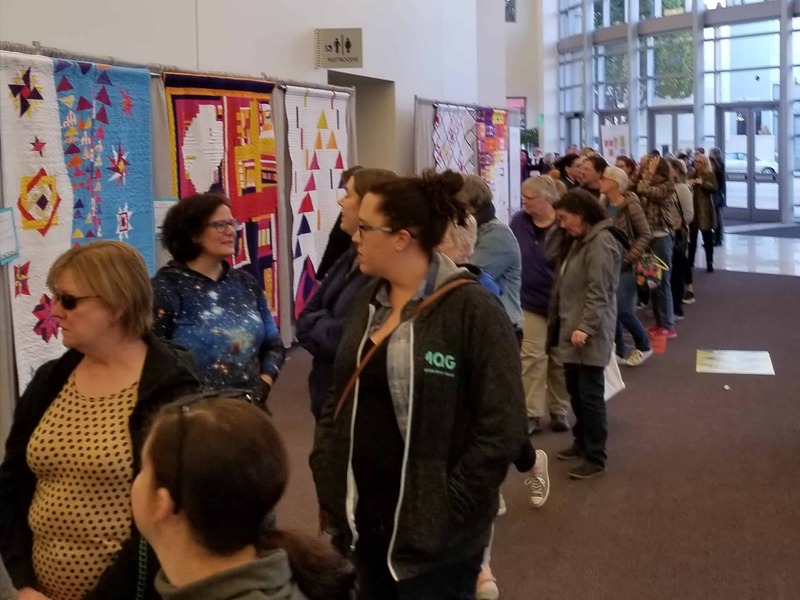 The thing about this conference was that it was more than a quilt show. It was like a conference I have attended for my professional organization. People knew each other; there were opportunities for learning aside from just quilt classes. Everyone was very focused on a shared set of …values or perceived values. [Actually, I am not sure if that is the right term, but it sort of gets at what I am trying to say.] 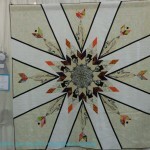 It was an event with aspects of a quilt show. I wonder if the AQS shows are the same way? I know I have said before that there was an excited buzz in and around the whole conference. 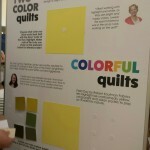 I really liked being in a place where everyone was excited about quiltmaking. Yes, there were people walking around who looked miserable. Yes, there were people there who were so absorbed by their phones and tablets that they couldn’t talk with anyone. Yes, there were people who only wanted the free stuff. Beyond all that were those who were taking advantage of opportunities. I tried to be one of those people. I was thrilled to see all the different solids in one place. I didn’t even know Northcott had solids until this show. It was wonderful to see vendors, albeit a small group, with the freshest, newest fabrics rather than the old junk that vendors feel ok with bringing to PIQF. I was thrilled to meet people I follow on Instagram. It was great to see manufacturers there! 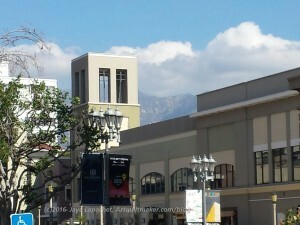 I was excited to talk with them, see what they brought and, on occasion, play their games. It was great that a few of the vendors brought donation quilt activities with them. It provided a good opportunity to sit and rest our feet while doing some good. 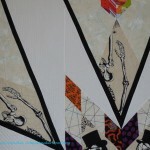 The quilt above was the Viewer’s Choice, Mr. Swirl E. Bones by Victoria Findlay Wolfe. 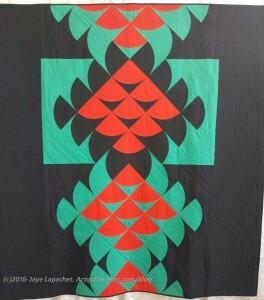 I voted for another quilt, but there was a lot that I liked about this quilt. It is a very interesting use of a panel. 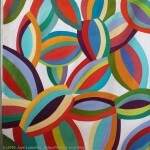 I also liked the kaleidoscopic effect she created by putting the different parts of the panels together. I also like the diamonds and the way the piece looks like a flower from far away (upper right photo). You also can’t tell that it is a skeleton panel with just one glance. 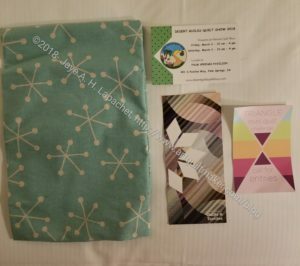 Windham gave away pamphlets showcasing their newest fabric designers. The snippets were about half a small page (8.5″x11″ folded in half) and had a few of the forthcoming prints with a headshot of the designer. It was nice to be able to look at a few pieces of fabric that won’t be out for months. Quilter’s Dream had a very boring looking booth. It looked like they had just curtains up and stack of samples. Samples are always nice. Somehow I ended up in the booth and found out that those boring looking curtains were batting samples! They had unrolled some batting and had hung it up so potential buyers could feel it. What a great idea!!! I liked the thinness of that batting and also the different content they had: silk, bamboo, polyester made from soda bottles and many more. 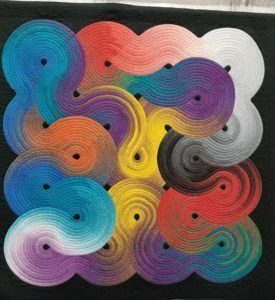 I want to get some to try in a quilt. I dropped my card off a Schiffer Publishing. 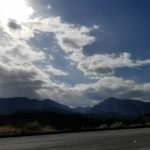 I have been wanting to send publishers letters telling them that I write book reviews and post them here. As you may remember, I donate 90% of the books I receive to my local library. My library is part of consortium, so those books are available to people in other local libraries as well. I haven’t heard anything, but my fingers are crossed. Schiffer does a lot of interesting books. I loved working with the Sizzix in Victoria Findlay Wolfe’s class. I have been looking through their catalog of designs over and over thinking of what I can make. 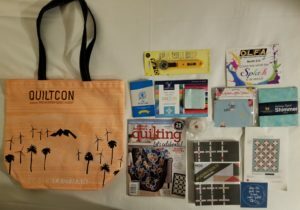 Below is a random collection of ideas and inspiration I got from QuiltCon. What would you do with them? 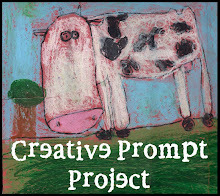 If you do a drawing or sample, post a link to your work in the comments. 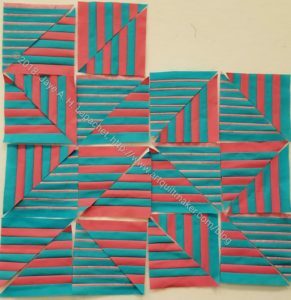 Start with different sized squares. 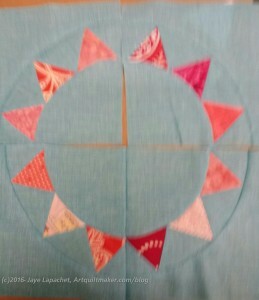 Add one border and trim all the blocks to the same size. Try Eleganza Perle cotton. I have never heard of it much less seen it sold. I didn’t buy any, but would like to try some. 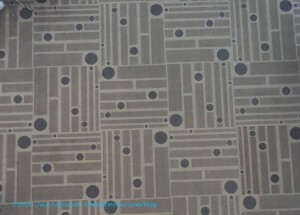 Rug in the convention center. 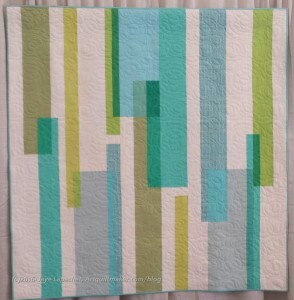 Great strip type quilt. On Saturday, I think, we attended lectures almost all day. I am not sure why I signed up for such a marathon, but with one exception they were all very good. First off, we were 5 minutes late for Mary Fons. The lecture started at 9am and I could have used a lie in that morning. They started, apparently, right on time, thus we were late. 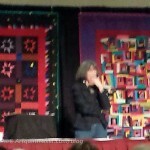 I thought she did a good job talking about quilt history. 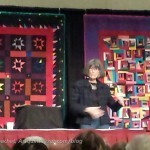 It wasn’t a perfect lecture, but she did a good job discussing most of the history of the modern quilt revival such as the Whitney exhibit and the effect of the Bicentennial. Included was mention of a variety of cultural issues/discussion that are relevant to quiltmaking such as gender in quiltmaking (do men get more attention in a female dominated environment), how feminism relates to quiltmaking (it’s ok to put a casserole in the freezer and go to a retreat) while giving a brief overview of the resurgence of quiltmaking. The late 1980s and the 1990s, a huge time for art quiltmaking, rise of shows, guilds and tools was not discussed as much. There was a discussion of the increase in TV shows, especially on PBS such as the groundbreaking Georgia Bonesteel show, Sewing with Nancy and, of course Fons & Porter. $4 billion industry. FOUR BILLION!!! 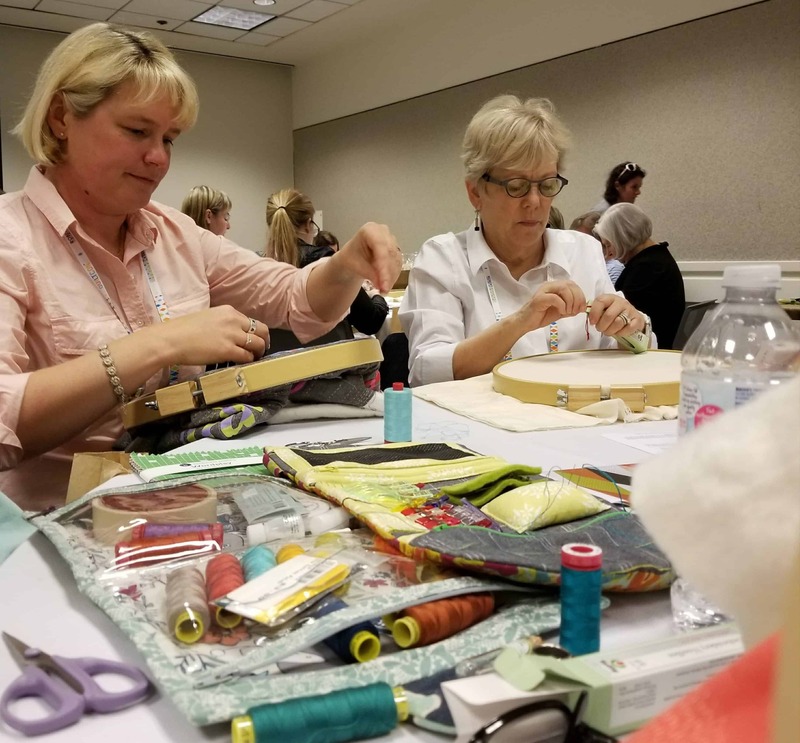 In general, throughout the lectures, there was a repeated suggestion for modern quiltmakers to look to the traditional quiltmakers (who are finding their way to modern guilds) and to learn from them. 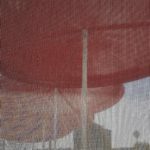 There was a constant reminder that the fabric used doesn’t impact the skill set. I heard it at this lecture first, but then throughout the conference as well. I thought that was very nice and speaks to some of my concerns about the exclusionary nature of the modern quilt movement. Libs Elliott was not on my radar until I heard about her from Kathleen and found out that LE is teaching at the Make It Modern Event in Reno in June. I didn’t know what to make of her. I am really excited about her now. Libs Elliot is an excellent speaker. She started off her talk with some comments about her family, telling us she is Canadian and grew up outside of Toronto. I got the impression she still lives near there. Her parents are antique dealers which provided a nice segue into her thoughts about objects, including quilts, having secret lives, they all have stories. She also said that when we make something, we are leaving our own marks and should feel a sense of pride. As an aside, thinking about the ‘lives’ of objects is an interesting concept to me. 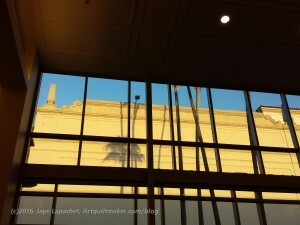 I like thinking about what the objects have seen and whether they absorb the history of where they have been. Kind of like Ashakic Records, but for objects. For her the past is calm and the future is exciting. Ms. Elliott likes clear simple lines. She enjoys using new tools and thinking about ways to use technology. 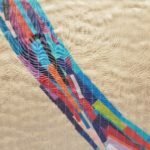 She is particularly interested in the intersection of technology and traditional craft. Creating designs using a computer code generator is an interesting concept to me. 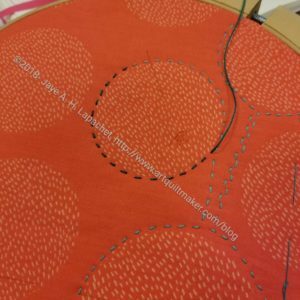 Some might think it takes all the work of the artist out of it, but there are still a lot of decisions to make: color, design modifications, size, fabrics. 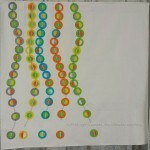 Elliott explained the process very well, incorporating that into the trajectory of her quilt career. 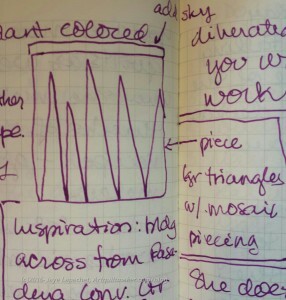 Her lecture clearly showed how she was moving forward within the space of creating quilt designs with code. The message I got was “never be afraid to ask”. The good thing about this lecture was that it was a panel and we got to hear about the different ways people deal with their scraps. I wasn’t able to appreciate the people who have one bookshelf full of fabric. I may have too much fabric, but they don’t have enough. JMO, of course. The members of the panel were Mary Fons, Christa Watson and Judy Gauthier. It was moderated by Rossie Hutchinson. You can see a picture of the panel on Christa’s site. Another good thing about this lecture was that I found Bungalow Quilting and Yarn. The owner, Judy Gauthier, was a fireball, a great marketer and an inveterate scrap quilt maker. 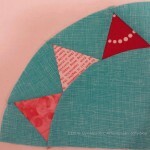 She has a new book, Quilts for Scrap Lovers out by C&T. She has written a number of quilt books and guides. I was only able to take a quick peek at the new book. Go and buy it anyway. She was awesome. As you can imagine, methods of dealing with scraps run the gamut. Mary does not usually use whole lines. She stores in scraps by color in an old, but refurbished dry goods cabinet and a large rattan basket. She also advises not to buy what you think you should buy, She encouraged the audience to love what you buy. Mary also talked about the ‘precious fabric problem’. 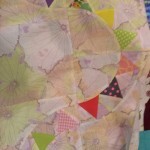 If you have fabrics that you love and pet and don’t want to cut into, put them on the back of a quilt for you. You will be able to enjoy them more. She encouraged the audience to enjoy your fabrics by using them. Christa is a minimalist. Her philosophy is Know It, Use It, Love It. I can appreciate that sentiment since I buy fabric to use. She cleared out her fabric sometime in the recent past and has one large cabinet for fabric storage. Christa buys and uses a lot of tone-on-tones. 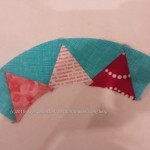 She also buys pre-cuts because she can use them up quickly and get a scrappy look easily. Judy’s philosophy is buy as much as you can and keep as much as you can. She stores her scraps by color. She does believe that the fabric should move you. Rossie put her two cents in as well and says she destashes scraps. She encouraged people to let go of fabric with which you are finished. She said to buy what you use and don’t be influenced by trends and formulas. Her theme was ‘admire don’t acquire’. There was a discussion of pre-washing with a mini poll during the lecture. Pre-washers like me are definitely in the minority. Mary led this short segment and said she now pre-washes everything. She reminded us that there are good reasons for pre-washing and also for not pre-washing. We were also reminded that pre-washing=pre-shrinking and if you wash some fabrics for a quilt you should wash them all so they don’t shrink differently. Christa pre-washes, though she doesn’t pre-wash her pre-cuts. She loves to iron yardage and enjoys touching her fabric. There was also a discussing of building a stash. Judy reminded people to buy colors that make you feel good and makes you happy. Be selfish and buy fabric that speaks to you physically. Also, buy the best fabric you can afford. One great tip was to figure out what YOUR basics are and keep those in stock. As part of this discussion there was a thread about using fabric. Contrast is relative: white makes buttercream yellow look dark. Contrast can be a problem even when colors and patterns are great. 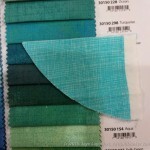 The panel left us with the admonition to USE OUR FABRIC!! 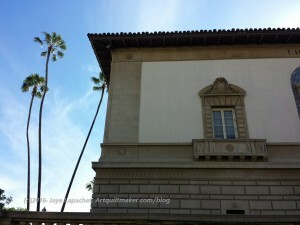 See part 2 of my report on the lectures. 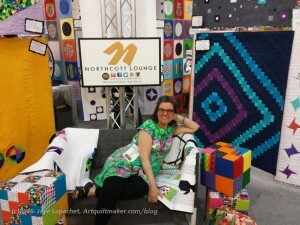 I can’t really say that this post is about Day 4 of QuiltCon, because we spent day 4 driving home. 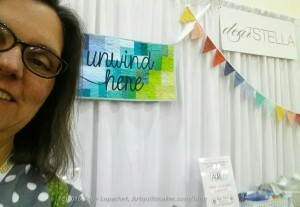 We spent little pockets of time having some fun in the vendor hall and the various rooms full of quilts, however. Some of the fun was discussed in a previous post. I won a fat quarter pack from Timeless Treasures. The ladies at the booth were very sweet and I was sad not to be able to spend time making a donation block with them. I may see if I can make one and send it along now that I am home. We got soft tacos at the convention center for lunch one day. They were very good. While waiting in line, I saw this hilarious sign. 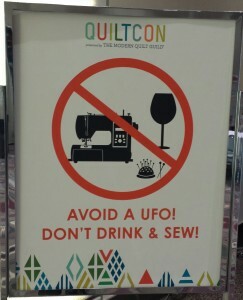 Do you think it means you will start weird projects if you drink and sew? Or that injuries might be involved? 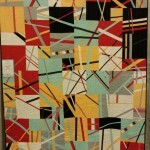 I mentioned that we saw the BAM donation quilt. 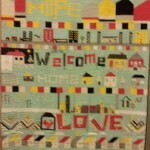 Michelle, the BAM organizer, wanted to see how it looked with some of the other donation quilts. Do you know that song about how nobody walks in LA? Julie pointed out a number of these young men walking exercise bikes down the street. 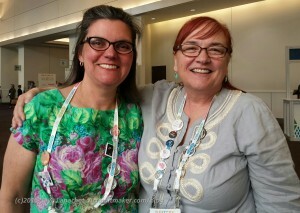 I was finally able to meet up with the fabulous and unbelievably kind Annie Smith (Frances’ best friend). 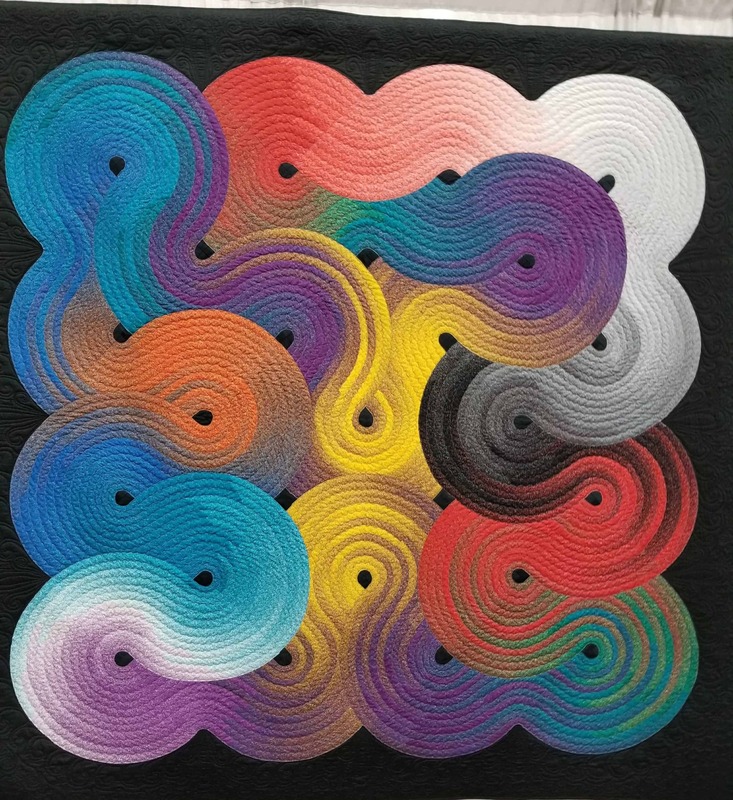 I am still on the fence about some of the quilts on exhibit, but I have to say that looking at them made me look at things a little differently. 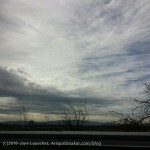 I am looking at scenes and shapes and scenery with an eye towards incorporating some of the lines into future quilts. With my newfound bias binding skills, lines are easier to contemplate. 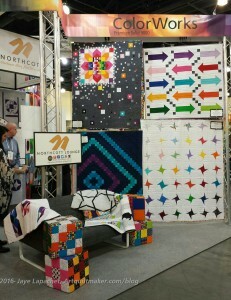 I really liked the big star quilt at the Northcott booth. One of the things I like about it is that it is a big block on a field of negative space,b ut the negative space is softened a bit by the smaller stars sprinkled around the negative space. Those smaller stars are concentrated more heavily around the large block. This whole layout is much more interesting than it would be with just that big block. Food was a little bit of an issue for me during the conference. One of the last days, I demanded Mexican food and there was a mexican place across the street from the convention center that appeared on my GF app. We were able to spend some time with Susan, the History Quilter, and Zina, @zanymouse, who were stuffed and only wanted a drink (not food). Regardless, we were able to catch up and I was able to get to know Zina better. I also was a little bit ridiculous at the Northcott booth. 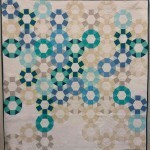 Charlotte’s comment made me feel a little better about my Fabric of the Year quilts not getting into QuiltCon. I knew the function of juries, but their job wasn’t on my radar and I was just thinking about *my* quilts not getting in. I wasn’t thinking about the overall look of the show. Thinking about the overall look of the show, I think that the jury did their job. She show was well coordinated and had good visual impact. 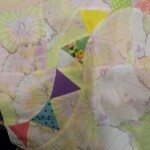 The question is: do I make a quilt I think will get into the show or do I continue doing what I am doing? The latter of course. 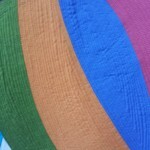 I don’t want to make quilts I don’t like or quilts that use colors and fabrics that don’t appeal to me. That is a recipe for instant UFOs. 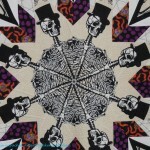 I think one idea of a show is to make a quiltmaker think. I am definitely thinking about what I saw. I have definitely been influenced by attending the show. I don’t know if what I saw will show up in some way in my work, but I think influences will. 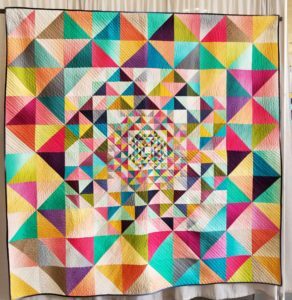 One thing that won’t probably change is my love of complicated quilts. 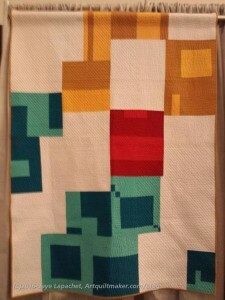 I have never been moved by minimalist art and translating that movement into quilts has not changed that. I don’t hate that style and will look at those pieces in a museum. I will always look at complexity and visual interest for longer.